Bassett Hound Puppy Bank - 1240 Discounts Apply ! 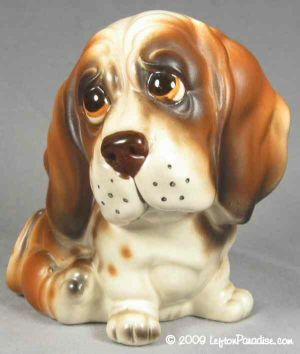 A sweet, sad-eyed Bassett Hound puppy coin-bank. The bank stands 4¾ inches tall, is marked 1240 and has a Lefton sticker. The rubber bank stopper is present and is in good shape.